A little about us here at Ooma Tesoro's. We are Michael & Robin Tesoro and we make premium marinara sauce. Handcrafted in small batches in the Berkshires using the finest ingredients. Simplicity is the ultimate sophistication. This will help us get over the hump! 🍕Doesn’t this make your mouth water? 🤤 #pizzaforeveryone #bestjarredmarinara #pizza #lovepizza #foodporn #marinara #pizzapizza #nomnom #gnamgnam #yum #eat #food #sauce #getsauced #sogood #delicious #intheberkshires 📸: who took this photo? Sundays are for family + slow food. All week long we are rushing and make our meals as quickly as possible so we love a day based on cooking together, no matter how long it takes! This lasagna recipe is w/ ground beef + spinach + mushrooms + (of course) cheese, pasta and marinara sauce. There are many options with lasagna, it’s hard to go wrong! Having your elements prepped before assembling is key. Have ready fresh ricotta (we use whole milk) grated parmigiana reggiano, grated fresh mozzarella, egg, pepper, sea salt, dash of nutmeg. Set this mixture aside. In a medium pan add little olive oil + a little butter + add 2 garlic cloves. Heat until garlic is clear but not burned. Add spinach and cooked until wilted. a little salt and pepper. set aside. cook mushrooms in olive oil with a little salt/pepper until soft but not mushy. set aside. warm up ooma tesoros in sauce pan. if lasagne needs to be cooked a little do that until just a little soft (par-boiled) you can also use no boil lasagna sheets. Bechamel: over low-med heat in sauce pan 1/3 of stick of butter and let melt add 2 more cloves of finely chopped garlic, let garlic cook but not burn. when cooked down a little add tablespoon of flour and whisk then add soon a little bit of milk. keep whisking keep adding the milk and a little more flour if needed keep whisking over heat until becomes thicker and simmering. salt and pepper to taste. set aside. 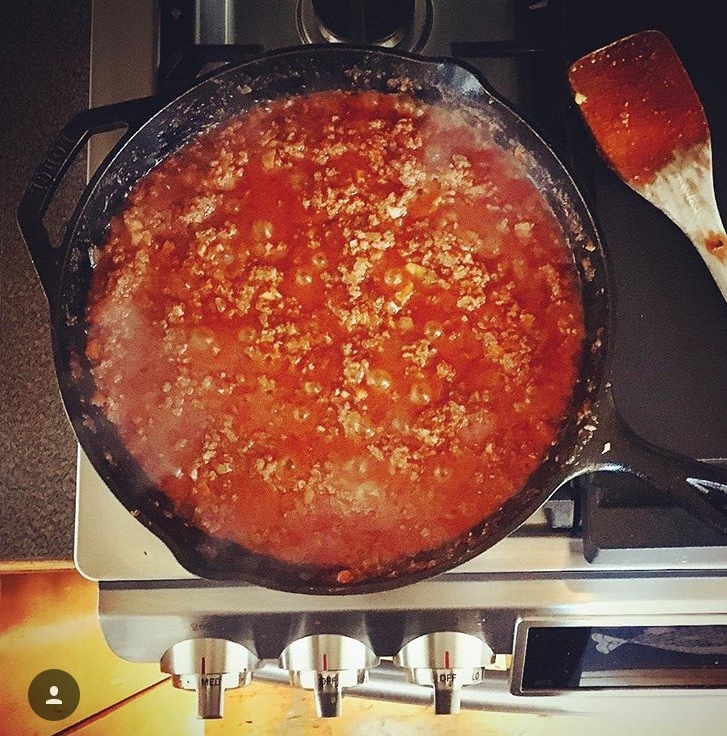 Have ground beef browned and ready cooked in Ooma Tesoro’s marinara. start with thin layer of Ooma Tesoro's marinara sauce on bottom with ground beef. Layer of lasagna noodles then layer of bechamel, then layer of lasagna, then layer of ooma's, layer of mushrooms then layer of cheese mixture, then another layer of lasagna, then layer of bechamel, layer of spinach, layer of oomas, lasagna noodles. Layer as your craving desires. Just do not over fill the glass because it will bubble over. Top with cheese/bechamel and cover with tin foil and put glass pan onto a metal cooking pan and into the over for 45 minutes until bubbling. After 45 minutes take tin foil off and raise heat to 400 for another 10-15 minutes. You can put oven on broil to brown the top. If you are looking for something very hearty, meaty and cozy on a Winter weekend this is for you. With all the simmering this is not a recipe for a quick weeknight dinner. Here’s the recipe: have ready, 1/2 cup finely chopped carrots, 1/2 cup of finely chopped celery and 1 cup finely chopped sweet onion and one clove minced garlic. Cook until soft in 4 tablespoons of extra-virgin olive oil and 2 tablespoons of butter. Add teaspoon of chopped fresh thyme basil, and 1/2 teaspoon of chopped rosemary, a pinch of salt and pepper. Add 1/2 lb wild boar sausage (take out of casing) 1lb of ground bison. Cook down for 10 minutes or so, stirring constantly. Add 2 cups of Ooma Tesoro's marinara sauce, slowly simmer. Add cup of dry white wine, continue to slowly simmer, then add cup of whole milk continue to slowly simmer. We served with tagliatelle and sprinkled with an even mix of freshly-grated Pecorino Romano and Parmigiano-Reggiano. Say NO to plain white pasta with sauce on the side! special technique to get that pasta to absorb the marinara sauce and take it to the sublime. When you cook for yourself, friends, family, you want to make your pasta taste just like it would in Rome. Its easy to achieve but you have to take a moment for one more step. After you drain the pasta put half the sauce into the pot and let simmer and just after it simmers put the pasta back in and put burner on high for less than a minute while you give the pasta a good spin and let that sauce absorb totally into the pasta. We marry them together.... The half of the sauce should be in another pot and ready to pour over the soaked pasta. Easy! Right??! In med/large pan, on medium heat heat some butter and olive oil mince a clove of garlic and chopped yellow onions, cooked until onions clear. Add drained can of artichokes and then sliced mushrooms, cook all down until mushrooms have softened and made liquid. Do not over cook. Add shredded chicken and just warm it up with mixture, do not cook more. (unless not fully cooked) set aside. In saucepan, tablespoon of butter, 2 cloves of minced garlic, cook garlic until clear but not brown. Add tablespoon of flour then wisk, adding milk slowly. Keep wisking as thickens, add more flour if needs more thickening. Should be a thick white sauce, you can add more milk or flour if needed. Set aside. have all “layers” ready before assembling, including warmed tomato sauce, Cheeses mixed in a bowl. Keep going until seems like it might overflow. Should have a layer of pasta on top and layer that with béchamel sauce and top with cheese. Cover with tinfoil on top of a flat metal pan and put in the oven….for 35 minutes. Check that it is bubbling. Then TAKE off FOIL and let cook for another 10 minutes or so until top is brown and is bubbling. Let cool for 30 minutes before eating. Kale + Mushrooms with Ooma Tesoro's Marinara and sauteed sweet onions and garlic. This fall in the Berkshires we've had a lot of market opportunities to demonstrate the versatility of our sauce. One of the biggest hits has been our "kale + mushroom bowl" which has turned a lot of anti-kale folks around. Today we served a lot of polenta, handmade meatballs, sautéed kale and "uova in purgatorio" (egg poached in marinara sauce) at the Downtown Pittsfield Farmers' Market and had a blast. We are excited to share our "kale bowl" recipe with you. Bunch of frizzy kale stripped, stemmed and washed and chopped loosely. bulb of garlic, then peeled cloves and smash with knife. We hope you make it and keep eating that delicious healthy kale! On the lighter side.... Zucchini instead of pasta for a change. Try this recipe for Zucchini Ravioli with Ooma Tesoro's Marinara. You will not be disappointed. In our kitchen we are always looking for ways to use Ooma Tesoro's with something other than pasta. As much as we are pasta lovers, it can be a little heavy on the belly. When this recipe popped up on Facebook via Delish, it was very inspiring. 6 medium green zucchini rinsed and ready. Grease a large glass baking dish with oil or butter. mix all the cheeses, egg, spices, fresh basil and garlic together in a big bowl until creamy. You will need a good surface, counter or cutting board to lay the "noodles". With a vegetable peeler peel the skins off two opposite sides of the zucchini then cut strips length wise along the zucchini to make "noodles". After you cut 4 strips, layer 2 down then another 2 across and keep doing this until you are out of Zucchini. when you have the zucchini strips ready you can take a spoon and form balls of the cheese mixture and drop in the center of each zucchini noodle then fold up the flat "noodles" to form a "dumpling" or "package" so they are nice and snug. Layer each ravioli in the pan and pour a little Ooma Tesoro's over one layer and add another layer over that. pour some more marinara sauce on top and sprinkle some extra cheese mixture over it and bake for 45 minutes until bubbly. (Note: the zucchini can be a little watery so you may have to pour off a little excess.) Let us know how yours turned out! Our hats are here! Purchase one case (12 jars) of Ooma Tesoro's marinara sauce and get a FREE trucker hat with your purchase until March 2016! We love our customers and we want you to REPRESENT! Berkshire Grown Holiday Markets are back!! This weekend we begin the holiday market season once again. Starting in Great Barrington, MA on Saturday 11/21 at Monument Valley Middle School and on Sunday 11/22 at the Williams College field house both are from 10AM-2PM. These are wonderful markets filled with many talented makers from Berkshire County and around. This will be the 6th year that we have participated starting with our first month of business in November 2009. We always love to return. We hope to see you there if you are in the neighborhood! Stock up on all your Thanksgiving needs. Buona Sera! Good Evening! Check out Michael on TV today! We have lots more to tell you and will be updating with stories and recipes! Stay tuned!